Memo to City Of Dayton administrators: Don’t be stupid. A city of Dayton administrator is the subject of an internal investigation after she allegedly e-mailed a newsletter to employees that featured an off-color joke with Peanuts cartoon character Charlie Brown. Employees received an e-mail on July 2 from Dynetta Brown-Griffith, the city’s Department of Water Safety administrator, with an attachment regarding safety in the workplace. The cartoon appears next to a section headlined “Allergy Meds at Work,” which details some allergy medications that might be harmful to use at work. via Off-color Charlie Brown cartoon has city administrator in hot water. Note- I don’t think this is newsworthy. But, I do believe in keeping you informed. Someone asked what the cartoon was- here it is. Thanks for getting it for me, I tried to find it on my own and failed. 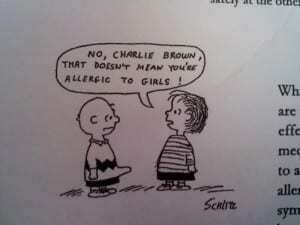 So this is the infamous Charlie Brown cartoon. What is the big deal, I got a chuckle out of it, nothing more then a close read, and passed it off. I would classify it has a ho hum. How anyone would make a case out of this, needs to live a life and not a dream. Now I see how this is a problem. I didn’t see Charlie Brown’s…err…woody. That is a bit of a problem.